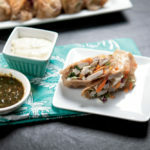 Tasty chicken tacos are made even better with a spicy horseradish-lime sauce. Did you know North Carolina is one of the nation’s top chicken meat producers? Heat 2 tablespoons olive oil in a large skillet over high heat. Add onions and saute for 5 minutes. Add red pepper and saute another 5 minutes, until onions are translucent and peppers have softened. Remove from heat and set aside. Season chicken strips with cumin, coriander and black pepper. Heat remaining 1 teaspoon oil in a large nonstick skillet over medium heat. Cook strips 3 to 4 minutes on each side or until no longer pink. Meanwhile, whisk together sauce ingredients in a medium bowl. Warm tortillas according to package instructions. Place ¼ cup spinach over each tortilla. Divide chicken evenly over spinach. Top with onion, peppers and horseradish sauce.